Ms. Davis was admitted to The Phoenix Rehabilitation & Nursing Center on May 8th, 2017 from Brooklyn Hospital Center for rehabilitation after a surgical procedure on her left ankle and foot. With this being the 2nd time with our community she was already very familiar about the services, amenities, nutrition and care to be expected; we were all very excited to begin this journey together! When Ms. Davis arrived, she was welcomed by the interdisciplinary team and introduced to what would be expected over the new few days by the concierge department. She was introduced to her nurse manager, social worker, dietitian and therapists; some of which she even remembered from her prior visit! 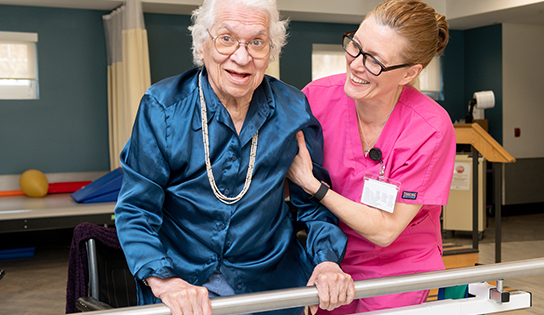 Ms. Davis was scheduled to have the same physical and occupational therapists as last time, who assisted her greatly in making such incredible progress. The team also scheduled Ms. Davis to receive physical and occupational therapy five days a week. Her goal was to be able to walk up two flights of stairs and to also be able to walk with a cane without any obstacles. During the first two weeks, she regained her strength from practicing on parallel bars, later graduating to the stair trainer for additional support. She also attended occupational therapy to improve her activities of daily living, practice self-care, bed mobility, and functional mobility. On June 12th, 2017, Ms. Davis was discharged home with simply a cane and she is now able to walk short distances and stairs. Congratulations for all of your incredible progress, Ms. Davis!